The Yashica 8 was far more significant than just the first product in a new market segment for the company. 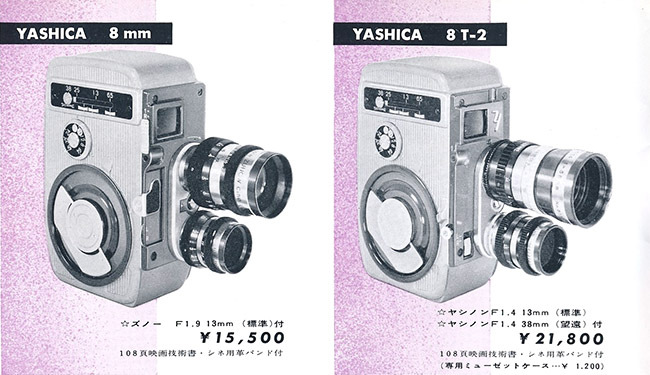 It signalled that Yashima was about to evolve from being a solely TLR reliant company to becoming a significant player across the spectrum of camera types, formats and related accessories. It also signalled that it was willing to work with lens companies other than Tomioka, in this case Zunow Optical Industry Co., Ltd. 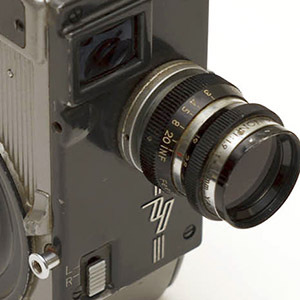 Although not absolutely verified, Japanese sources claim that its relationship with the renowned lens and fledgling, innovative, but almost immediately unsuccessful SLR maker ended with Yashica formally acquiring the bankrupt company in January 1961. 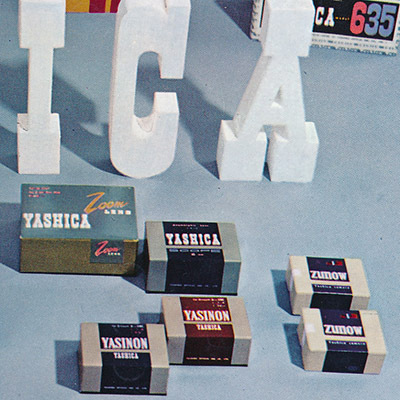 Whether Yashima had any development assistance for the camera body is unknown but certainly, Yashica 8 production would have introduced new skills, capabilities and capacity that would enable the company to undertake its forays into other market areas. 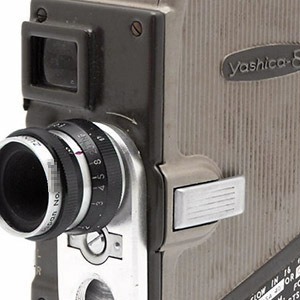 The Yashica 8 is a typical home movie camera of the time. Feature wise it is basic but it is well built with a die cast aluminium body and good quality for its positioning. It uses standard 8, also known as double 8, cine film. This is 16 mm cine film with twice as many sprocket holes down either side as “normal” 16 mm for use in 16 mm cameras. Only half the width of the film is exposed when run through the camera. 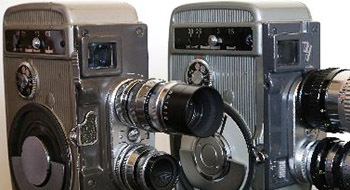 The length of film is about 25 feet and when the end is reached, the camera is opened and the film spools flipped top to bottom and then the other half width of film can be used. After processing, the film is split and spliced together giving a total length of about 50 feet, or about 4 minutes of viewing time. As common at the time, the Yashica 8 was powered by a spring driven clockwork motor. With a fully wound spring, running time was about 30 seconds. The normal shooting frame rate was 16 frames per second but the camera was capable of a number of frame rates from 8 to 64 frames per second. The viewfinder could zoom from a wide angle of 6.5 mm to telephoto length of 38 mm to match the lens in use - the normal length for the format was 13 mm. I know that they are earlier because of the serial numbers, they all identify “Yashima” as the maker, instead of “Yashica” (the changeover of the company name on cameras occurred in September 1958) whereas either can be found on the later variants and they all have the serial number inside whereas the later variants mostly have it outside on the door (the first examples are still inside). Note, the left Yashica 8 panel shows two lenses mounted. As suggested by the pricing, it was sold with one lens mounted, the other, wide angle and/or telephoto, was available as an accessory item. The Zunow telephoto upper lens shown in the upper position was available for 6,800 yen which would make the total price 22,300 yen, so effectively the same as the 8T-2 with a small discount for the second lens included as standard with the latter camera. As noted earlier, several sources refer to the Yashica 8 being released at Photokina. The website Anna & Terry Vacani Binocular & Cine Collection more specifically claims that the camera debuted at Photokina in July 1958 with two models offered; the single lens “Yashica 8S” and the twin lens “Yashica 8T2” (stet). Clearly, Photokina was a world debut of both the new models and the Yashica 8 movie camera product in the generic sense. 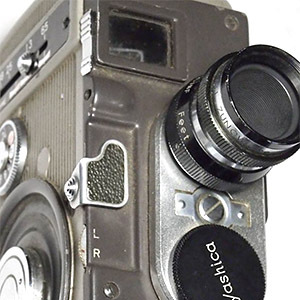 In Japan however, the “Yashica 8” model had been in production since 1957 and was now superceded. The single lens “Yashica 8S” was now without turret. Even though production seems to have started simultaneously with the new turret versions, it oddly doesn't feature in the early Japanese brochures. The earlier standard Zunow 13mm f/1.9 had morphed into the same spec Yashikor (fitted to this model only). A Japanese blog site has compared a Zunow Cine f/1.9 13 mm lens to the same spec Cine Yashikor and at least the barrels are identical (can be seen with the two Zunows above and the Yashikor immediately below - note two of the lenses have the removable front black rings fitted, short shades, one doesn't). As well as the differences with the Yashica 8 (most obviously with shutter release, viewfinder and door latch) noted above, the new twin lens version features upgraded 13mm f/1.4 and 38mm f/1.4 lenses now called “Cine Yashinon” and according to a circa 1958 Japanese Yashica Brochure, which features both the earlier “Yashica 8” (as all the early boxes are named) and the later camera (referred to as a “luxury” version), it came with both lenses fitted and was called the “Yashica 8T-2”. I have photos of otherwise identical boxes marked with both “Yashica 8T-2” and “with two lenses” and “Yashica 8T” and “with one lens” (Yashinon 13mm f/1.4 lens still mounted on the turret) - I am not sure if one arrived first or both were released together. The Japanese brochure (linked immediately above) displays a pair of accessory wide and telephoto f/1.9 “Zunow Optical Co.” cine lenses on page 12 (PDF numbering) and the same length f/1.4 Yashinons on page 11. Interestingly, the Zunows are the same price as their wider aperture Yashinon counterparts. The Yashica 8 examples featured in the brochure can be seen fitted with Zunow lenses. Whilst the Yashikor lens appears to be identical to the equivalent Zunow, I'm also inclined to believe that Zunow Cine lenses were the origin of the Yashinons. Like earlier with Tomioka TLR lenses, I believe that increased volumes allowed Yashica to negotiate better deals and impose their own lens names. There is a tendency to assume that Tomioka was responsible for all Yashica's lenses, with the term “exclusive supplier” being a well-worn catch phrase, but clearly, that stems from the TLR side of things and seems to be only partly correct in the bigger scheme of camera production and who knows whether Zunow, or someone else, contributed to some 35mm lens designs as well. 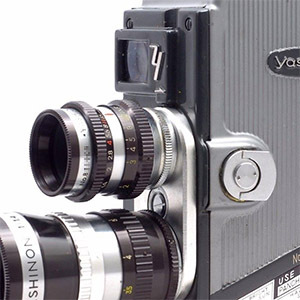 A “Yashica Scope” 2:1 Cinemascope (Yashica's description) type anamorphic accessory lens was available for all models. This would be fitted to the camera lens and then used later for the projector lens. A special viewer screen attachment slid over the viewfinder via the slots at the top and bottom visible in photos. Also available was a zoom lens with range from normal (13 mm) to a moderate telephoto (38 mm). This would be mounted on the turret, or single 8S mount, and connect by bell crank to the viewfinder slider. The central pivot point for the bell crank is the hole on the side that can be seen just below the viewfinder in all models. A wheel connected through the axis of the pivot point is used for zooming and operates the lens zoom and the viewfinder concurrently. The origin of these lenses is unknown. 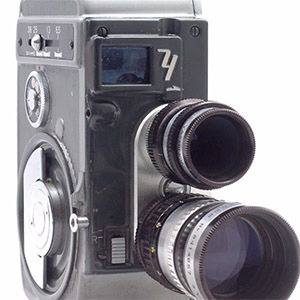 Note: There is a statement in English Wikipedia that “With the assistance of Tomioka Optical Works, Yashica adapted Zunow lens designs into its own 8 mm turret cine (movie) cameras.” That is total nonsense but unfortunately repeated verbatim on many other sites. The lenses are standard D mount cine lenses used on other brands as well as Yashica, e.g. Elmo and Arco (specs varied and there were minor cosmetic differences), i.e. there was nothing to adapt! The source for this claim is quoted as camera dealer Pacific Rim Camera. In fact the several source articles by Pacific Rim Camera note the lack of information about Zunow and most of the comments are based on observation and (incorrect) guesswork without any claim of factual evidence being made - the intent of the articles was to simply present the Yashinon-V Zunow lenses found on a triple lens turret Yashica T3 movie camera (advertised as 8T3), released in 1959, as something unusual and interesting. These were in fact the standard lenses for the model.